Make room for nature this June - no matter where you are or how busy your life! When you sign up to the challenge, we’ll send you a pack full of ideas, encouragement and Random Acts of Wildness. You’ll also receive a funky wallchart to track your progress, a wild badge, and regular blasts of inspiration throughout June to help you make nature part of your life. A Random Act of Wildness is any thing that you can do in an average working day to bring a little nature into your life. They can take a few seconds, a few minutes, or if you lose yourself completely, a few hours! We've got 101 ideas below - but you can make up your own, too! Spot otters, watch for water voles, find a fox, be a Citizen Scientist. From birds to butterflies, from trees to toadflax, watching wildlife can be more than just a hobby; become a Citizen Scientist and help with conservation on a vast scale. Surveying means getting people involved, hands-on with nature so we can understand and monitor the state of our wildlife and accurately plan conservation action where it is needed the most. And people are needed as any internet search will show you! If you don’t feel confident identifying wildlife by yourself, get in touch with your local Wildlife Trust and you could help out with one of their surveys. Do you wander lonely as a cloud with Wordsworth? How shall you compare thee to a summers day with Shakespeare? Nature is a theme that has run through poetry for millennia, and you can see why! Natural beauty is everywhere and an unrelenting source of inspiration. Poetry is the oldest form of literature and has birthed some of the greatest writers of all time, boasting names such as Beowulf, Socrates and Plato, to Philip Larkin and poet laureate, Carol Ann Duffy. Join them, and have a go at writing a poem or blog about your favourite wild place. Sign up to 30 Days Wild and get a blogging pack to help you spread the word and showcase your wild side. Some garden flowers follow the sun as it travels across the summer sky: find some (daisies or sunflowers for examples) and snap them every hour to see how they’re moving. Then on a wet day make a flower photo montage to remind you of summer! Even better buy some sunflower seeds now and grow your own patch that would make Van Gogh proud. They are available as short growing varieties as well as the giant competition sorts so pick the ones that will fill your patch nicely. Enjoy the flowers and the insect visitors, and feel great that the seeds will feed the finches in your garden in the autumn. Find somewhere with a view to the west, stay up late and admire the setting sun in all its colourful glory. What do you notice about wildlife at this time of day? The lower the sun gets the more exciting species you’ll see. Look out for bats that dart overhead in the changing light. If you have a bat detector, now’s the time to get it out and listen to their calls well into dark. If you’re quiet and still, will you get a visit from a curious badger, or a mischievous fox? Hedgehogs are also most active at night. Take a look here to see how you can help the nation’s favourite animal. Visit out Wildlife Watch website where you can find loads more, amazing activities for the whole family to do! 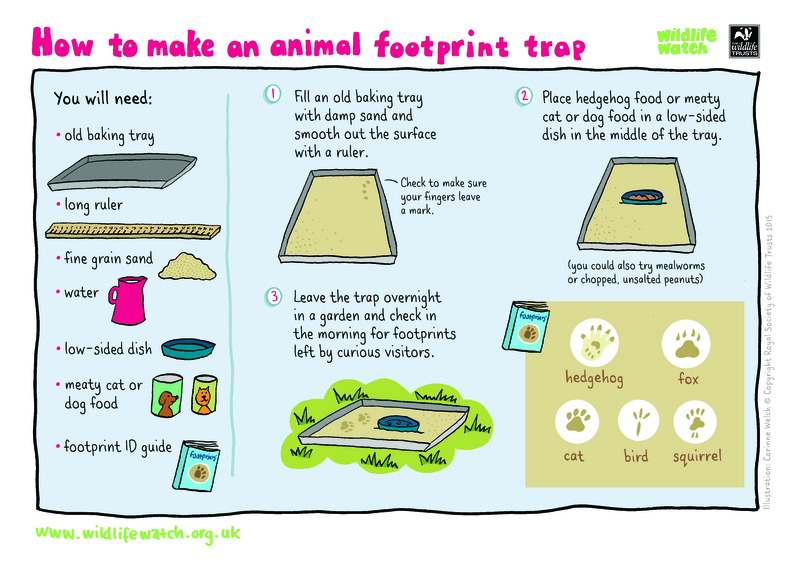 Why not make a footprint trap, put it outside overnight and look in the morning to see if you had any night-time visitors to your garden. 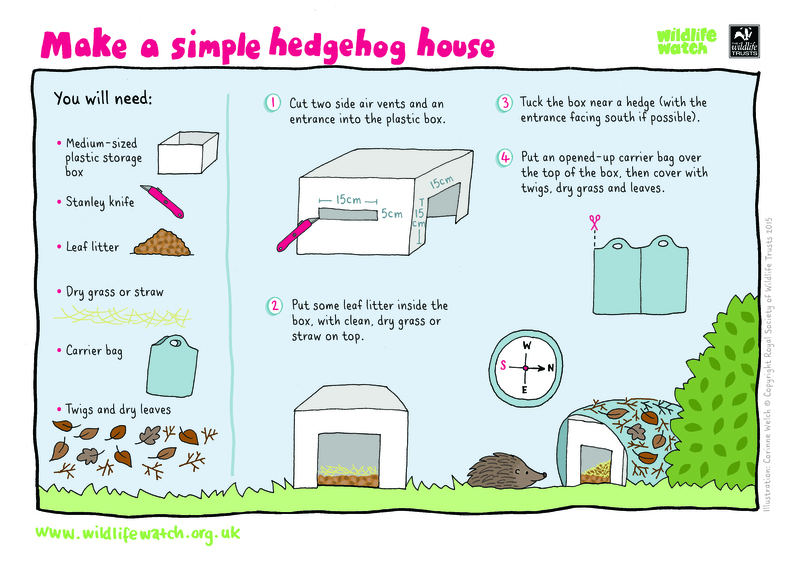 Or help a hog and build a hedgehog home. Some of the most wildlife rich areas can actually be urban gardens! Why not start a weekend project that helps wildlife and brings nature to you. Turn your gardens into hedgehog highways, create insect hotels, build bat boxes for our flying friends! Take a look at our activity pages for how-to guides for the whole family! Plant some wildflowers, perennial plants that will survive the rough and tumble of coarse grasses might be red campion, oxeye daisy, common toadflax, and field scabious. Shaded areas could have greater stitchwort and woodruff, whose white flowers will brighten up any mini woodland. Don’t worry if you don’t like insects; an increase in bugs will also bring an increase of their preditors too! You’ll see loads more birds in your garden and even some night-time visitors, like hedgehogs and badgers. Join your local trust and get an unforgettable first hand experience bird ringing. Watch how the experts do it and learn more about your favourite species while getting up close to the birds. Your local Trust may be running an event soon, so check our events page for an exclusive chance to see beautiful birds in hand. The first stop in conservation is understanding. The practice of bird ringing goes back 100 years, and has led to a better understanding and increased of our knowledge of birds and bird movements, and ringing allows us to monitor the species and the bird’s longevity. The initial capture allows us to check that the bird is unhurt, to check feather conditions, age and to take measurements. Any captures after this allow us to look at behavioural traits, such as feeding patterns, migration and movement, and population studies. The rings that are put on the birds are small circles of plastic or metal, and do not affect its ability to feed, fly or move. Recaptures happen all over the world, and the unique number printed on the ring allows the bird to be identified. Most birds return to their first brood site each year, making population studies this way, easier; particularly as offspring can be identified. Investing in a bat detector could lead to one of the best experiences that few can boast of. On summer evenings as the sun begins to set behind the trees, lift up your bat detector and listen out for the calls of the bats. Immerse yourself in a whole new world, where you’ll watch with your ears instead of your eyes. June is a perfect time to observe bats as insects are plentiful. Where bats live is called their ‘roost’, but they roost in different places at different times of the year. In the winter, when bats go into hibernation, they usually move into caves or disused mines or tunnels, where the temperature is cooler and they won’t be disturbed. For several weeks in summer, female bats live together in a ‘maternity roost’, choosing somewhere warm to have their babies. They stay here until their babies are able to fly and feed themselves. For this years Wild About Gardens Week, The Wildlife Trusts, The Royal Horticultural Society and The Bats Conservation Trust are teaming up to bring you everything batty! Take a look for our resident bats or find out what you can do to help all the wildlife in your garden. If you don’t want to invest in a bat detector yourself, take a look at our events page and see if your local Trust is running any events near you! You can watch the experts, learn more about bats and have a great time! Build a bat box here and give our furry flying friends a helping hand roosting. For a footage of bats, visit the Devon Bat Project site. You know what it’s like: it’s raining outside, the sky is grey, you want to see the amazing scenes nature has to offer. When you’re stuck inside in the middle of a summer thunder storm, watch a wild webcam and experience the sights and sounds of nature – from nesting ospreys to barn owls, red squirrels to bats. Our Trusts have webcams set up all over the country looking at the best, the cutest, the rarest native birds nesting or hunting. There really is something for everyone here. Pull a hat over your eyes, cross your hands behind your head, and chill out and take a nap in the long grass and flowers of a meadow or wild area. With the warm sunshine, blue sky and gentle buzzing of insects, what could be more therapeutic than really being in the present and feeling your surroundings? Spending time in nature is really good for you, helping you feel happier and healthier. It’s easy to get caught up in the busy city lifestyle, raising stress and tension levels. Nature directly combats these, alongside depression and anxiety and leads to a sound wellbeing. So bring along a picnic blanket, lay back in the sunshine and soak up all that Vitamin D, and you can return to your day relaxed, refreshed and better off for it! Help protect the places that wildlife needs to survive and support a campaign. Did you know that over half of our British wildlife lives in the sea around us? The seas around the UK have the potential to be among the most productive and wildlife-rich on Earth. Hidden beneath the surface are landscapes every bit as varied and beautiful as those we see on land, with undersea cliffs, caves, chasms, mountains, dunes and plains. Colourful reefs, meadows of seagrass and other extraordinary habitats are home to many thousands of plants and animals, from tiny corals to the massive basking shark (the world’s second largest fish!). The seas help us more than we know; they are also our life support system. They absorb vast quantities of harmful greenhouse gases, while releasing oxygen for us to breathe. They regulate the climate, and good bacteria in the sea help govern clouds and rainfall. Our coasts and seas play a central role in our nation’s history, identity, wealth and happiness. Next time you’re baking, make it wildlife themed: you could make cakes with flowers or insects on them, or if you’re feeling really ambitious, try making a hedgehog cake! Try making Elderflower Eton Mess for a super-easy dessert, while you can still pick the elderflowers (best in June). They can be found in most hedgerows! Just make an Eton Mess using double cream, broken up meringue (made with free range eggs) and your favourite soft fruit (strawberries are great for Eton Mess), but allow your fruit to marinade in elderflower cordial for an hour before adding it. Sprinkle fresh elderflowers on top to finish. Yum! This year, Wildlife Watch has teamed up with Brambly Hedge to bring the characters we all love to life! 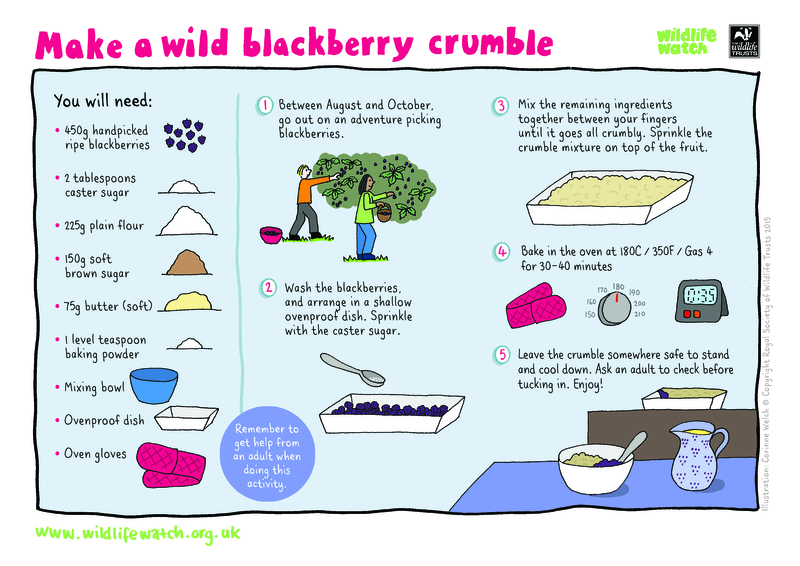 Take a look at Mrs Crustybread’s Blackberry Bun recipe, or try one of your recipes! Sadly, we’ve all got to go to sleep. True, but night-time is when the best, and some of the rarest animals come out! Furry foxes, brilliant bats, black and white badgers, marvellous moths! Even when we sleep we don’t have to miss out on the action. Have a go at making a mammal tunnel: it’s really easy and the whole family can enjoy. You never know what you’ll get in the night! Use our spotting sheet to get to know what visits in the night! How about making the most of the warm evenings and make a moth trap to see how many of these fascinating creatures we miss by going to sleep when it gets dark? You can make a light trap, or try wine ropes to attract them. Remember not to touch any moths you gather: they’re really delicate. If you don’t feel comfortable with moths by yourself, take a look at our events page to see if your local Trust are running an event! Why would you ever want to go to bed again! Shine a torch on a pond at night and meet a newt! Check out our Newt Feature Creature for a look at this amazing amphibian. The breeding season begins immediately after winter dormancy in February or March, depending on temperature, and continues until Mid-June. Females lay their eggs individually on submerged vegetation and fold the leaf over them to protect against predators. Newts leave the ponds during the summer, moving into terrestrial habitat to feed on invertebrates such as earthworms and insects. They go into hibernation around October, however will remain active until night-time temperatures drop below 5°C. Over-wintering sites for newts are sheltered, damp, cool, and frost-free such as; underground cracks and crevices, rotting tree stumps, and rock or log piles. The general rule for newts is to look, but not touch. Our newts are protected by law, and moving or handling them without the proper authority can land you in serious trouble. For a more hands-on encounter with newts, contact your local trust. Rewild your family by banning all electronic items from being switched on for a day – TVs, tablets, phones and computers are all out! Tune in to nature instead! To the seasoned parent, this can seem impossible! But with a little planning it actually works! Start by getting outside and go for a walk. Bring a packed lunch with you and picnic under a tree. You can burn up to 100 calories in an hour on a brisk walk, but don’t forget to look around you and enjoy what you see and hear. Start a family I-Spy game, or Plant, Animal, Mineral based on your surroundings. Finish off the day by eating dinner in the garden, and play board or card games whist the day is still hot. If you’re stuck indoors all day, don’t spend your lunch indoors too, especially in the summer weather. Picnic under a tree, or feed the birds at a local pond. Get back to your childhood and meet up with your old school friends outdoors. Make a daisy chain at lunchtime. See if you like butter by putting a buttercup flower under your chin! Get everyone to bring along a dish to share. If you fancy more activity and trying something new find out if there are tai chi groups you can join in your local park in your lunch hour. Its the perfect low impact exercise for anyone no matter how young or old, and improves your breathing, balance and wellbeing. Just remember to go back to work after! Leave a log for stag beetles. This magnificent, declining species needs dead wood to survive. The female lays her eggs in the rotting wood and the larvae develop here. The male stag beetle is easily identified by his huge jaws that resemble antlers (can you see where it gets its name?).. Both sexes have a shiny black head and thorax, and chestnut-brown wing cases. You’re most likely to see a male in flight on those warm summer evenings between May and August, while it is searching for a mate. It can take up to five years for the stag beetle’s larvae to develop into adults and sadly these beautiful beetles live as adults for only a few months in the summer in order to mate. There are two main requirements for stag beetles: dead wood and minimal disturbance. A log pile for stag beetles will also provide shelter for invertebrates, and the best logs are in partial shade or partially buried (to stop the logs drying out). If you place them vertically, you can use this as a feeding table too: place seeds on top to attract birds. The log will attract other insects too; perfect food for the larvae and birds alike! For a whole family creation buy some laminating sheets and laminate your favourite feathers, leaves and flowers and make some window hangings to remind you of your great wild June adventure. Things will work better if they are dry, and of course they need to be thin enough to feed through easily. Feathers, flower petals, and leaves work well, and flowers add some pretty colour like a stained glass window. You could even use these to decorate a tree. For the younger members of the family, have a go at a butterfly painting! Those rainy summer days don’t have to be spent in the house. Take a trip down to a local reserve and get cosy in a bird hide. Bring a flask and a packed lunch too! Or in the sunshine, the shade can be a cool welcome from the heat. From nesting ospreys to wintering bittern, hides nestled in the reeds or the woods, help you blend in and get closer to wildlife. But it’s not just birds that you can see from these hides: look out for otters or water voles if you’re near water! The shiest, best, rarest birds can be seen from hides, but get comfortable: you’re going to need a lot of patience. Bird hides are there to allow you to get close to wildlife, especially shy birds. Visit a local nature reserve and be surprised what you can see from a hide. Don’t forget your binoculars! You can help your little ones make their own binoculars! Take a listen here and learn the sounds you might hear in a hide. Treat yourself to a wild weekend away! Bring the whole family, or escape from the kids. Go gannet-watching in Alderney, to Skomer for manxies, Handa for nature volunteering, and loads more! If you head to the coast, you can visit a seabird city! The cliffs and rocky islands of our coastline are home to some of the most important seabird colonies in Europe. Join the Wildlife Trusts and encounter one of our Top UK Wildlife Experiences. Our seabirds spend the winter feeding far out to sea, but as the warmth of the summer arrives they all make a beeline for the nesting cliffs. With thousands of birds in one place, the air is full of whirring wings as adults go back and forth, bringing food to their sitting partner or growing chicks. And round it all off with fish and chips. Yum! (Though watch out for thieving gulls!) The Wildlife Trusts has a fantastic guide for the best places to see thousands of birds, guaranteed to take your breath away. You can even stay on a Wildlife Trust reserve! The Wildlife Trust of South & West Wales have the beautiful Oak Tree Cottage on their Teifi Marshes reserve where you can stay. Gwent Wildlife Trust own Pentwyn Farm Cottage, a lovely, traditional Welsh stone cottage. Gannets © Richard Bowler, Puffins © Lynne Newton, Oak Tree Cottage © The Wildlife Trust of South & West Wales. Off with the shoes and socks and dive, feet-first into nature. On your lunch break, at the beach, in the park: it doesn’t matter where, you can get wild. Our feet are super sensitive. You might not think it, walking around all day but, protected by shoes and socks, the skin on the soles of our feet is soft and full of nerve endings. That ‘aah’ moment you get when you take off your socks at the end of the day proves it! How many wild landscapes can you feel through the soles of your feet in a few minutes? Or squidge those toes between oozing mud for a free pedicure. But be honest, do you need an excuse to dip your toes into a cool stream, or to feel the tickle of grass brushing your sole? Get stuck in!What better way to re-connect with nature than to get a little bit wild. Make a bark boat and watch it set sail across pond or stream: how far will it travel? What insects will it sail near? There are invertebrates that live in and on the water. Go pond dipping to have a closer look at the underwater world we don’t often get to see. Ponds are particularly good for invertebrates including the large red damselfly, common darter and broad-bodied chaser dragonflies. More common creatures your net may sweep up are caddisfly larvae, water boatman, dragonfly nymphs or water scorpions. After you have had a chance to observe them in a container of pond water, don’t forget to put them back where you found them. 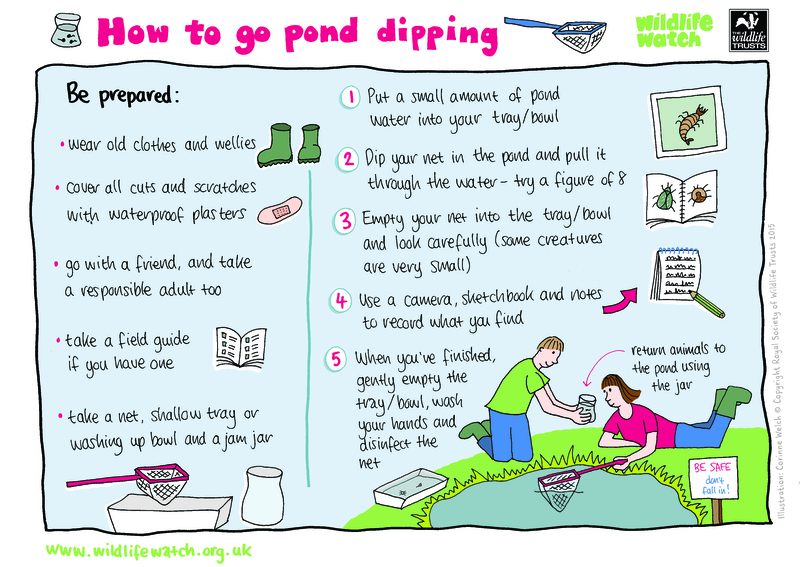 You can download the full activity sheet, and discover loads more, on our Wildlife Watch website! Mix a wild cocktail, fresh brew or leafy salad using an ingredient you’ve found in nature: elderflowers, dandelion leaves and nettles have great flavours. 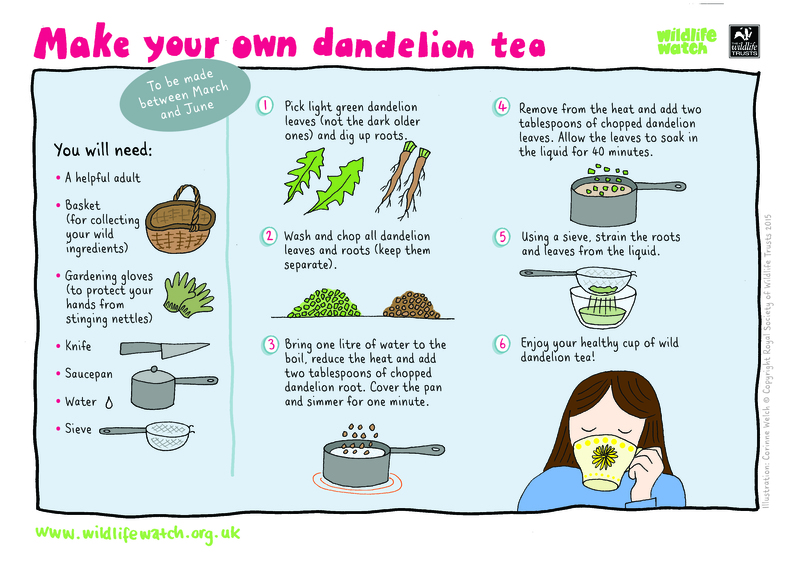 Collect some wild dandelions and brew some dandelion tea, used in folklore to promote liver health and to aid digestion. Take a look at our guide and make your own. If you’re after a cold drink, why not make a wild cocktail (or mocktail)? You can find yummy berries and leaves (like mint leaves) that can bring your drink to life. Just make sure to identify them properly before you tuck in – if in doubt, leave it out! We’ve got an activity sheet for that too! Take a look here! On a hot summer’s day, the perfect accompaniment to an ice cold drink is a fresh summer salad, light and natural. Nature is as bountiful as ever if you know where to look. Add some wild berries to your salad: strawberries or raspberries add a little sweetness. Pick some flowers for a floral kick: rose petals, violets or jasmine will add colour and flavour. Always look out for wild herbs that can be used in all cooking. If you find some blackberries, make a wild blackberry crumble perfect hot out of the oven with a little whipped cream. 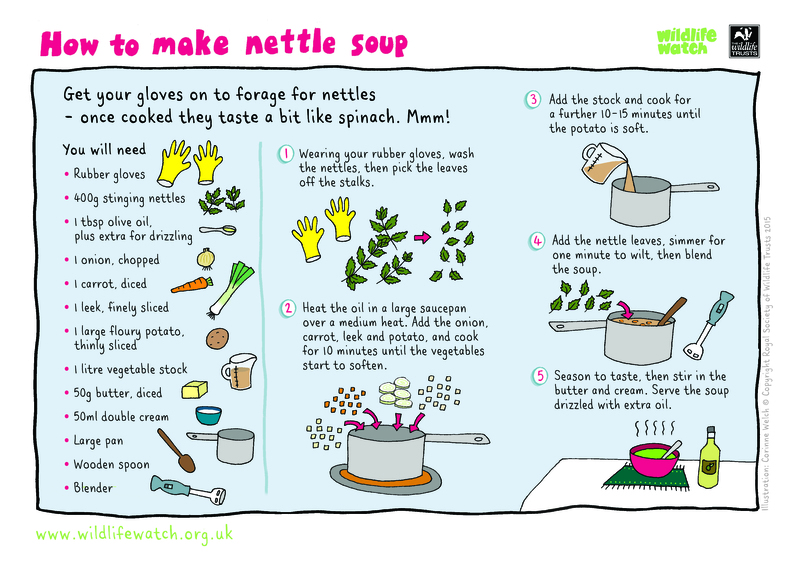 Or if you’re feeling more adventurous, try making some nettle soup! But remember, if you’re not 100% sure what it is, leave it out! Close your eyes and think back to those primary school lunchtimes sat on the playing field, the sun shining, the grass tickling your legs. Get back to the wild times and make some floral jewellery from nature. Who needs diamonds and precious metals when you can use the natural beauty that grows around you. Make a bracelet or a necklace or, if you’re feeling regal, forge a wild crown and become a king or queen of nature. The white and yellow combo will summer-up any outfit. Competition is the name of the game. A little healthy rivalry can liven up the dullest of tasks. Wildlife Watching is far from dull when you can spot hunting hobbies, watch the riverbanks for Ratty, listen out for skylarks or gaze in awe at orchids. Car-pool with your colleagues on the way to work and see who can spot the rarest bird. Hold a competition at work to see who can collect the most recycling refuse (for bragging rights, of course!). Find a four-leaf clover before your friends for extra luck. To help you on your way download our app. Photographers © Amy Lewis, Hobby © Dave Curtis. Team up with your neighbours to create a whole world for your local wildlife: cut small holes in fences to create highways, build hotels and houses, even create restaurants. What better excuse to share a wildlife gardening vision that goes beyond your own fence. Even if it’s only a few neighbours, it’ll be a whole world to the wildlife. For thousands of years, nature and wildlife have been the focus of art. Look at cave paintings; there are drawings of animals and people alike. Use the beautiful bits of nature that you can find around you and make your own wild work of art. Wildlife Watch has some amazing activities that the whole family can enjoy! 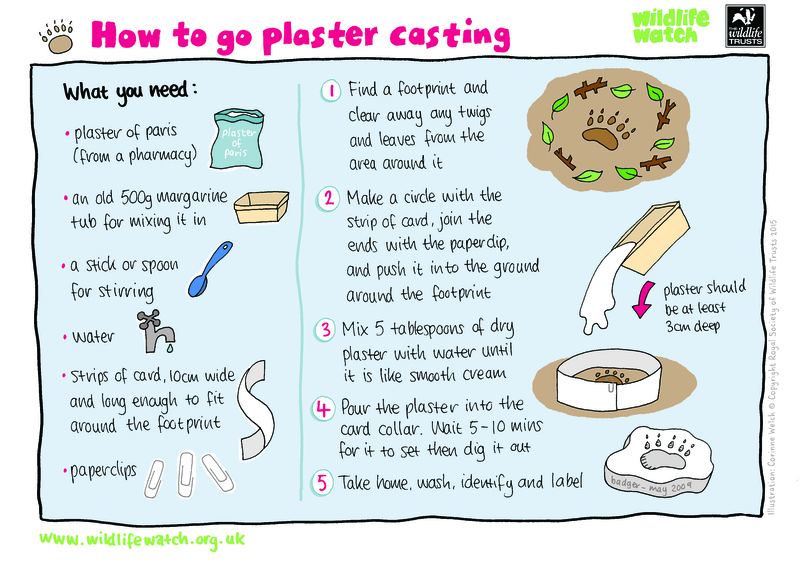 Have a go at plaster casting a footprint to take home. It’s really easy and looks great. 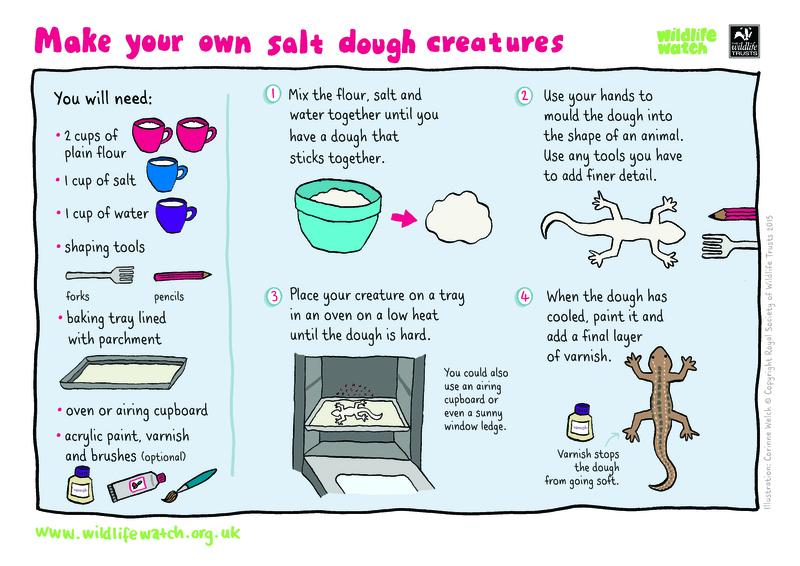 You can have a go at making a salt dough creature. You can make wild animals, or go wild and make up your own. Why not make a Guardian of the Forest to protect nature? Make your salt dough into a grotesque face, stick leaves and twigs for hair (but not if you bake it dry! ), paint it and hang it up like a gargoyle to protect the trees. Create artwork in the wild using leaves, pine cones, twigs, feathers – whatever is to hand. Leave it somewhere – on a branch, by a path, by a bench – and it will make a lovely surprise for someone else to enjoy. Take a look at our Pinterest board of wild nature art for some inspiration! Prepare the birds a picnic while you a prepare your own. Seeds, fruits, nuts and cheese are best for the birds (and you, if you’re feeling healthy) and see which food they prefer. Steer away from giving them bread though, it doesn’t have the nutrients they need to be healthy. Don’t forget the drinking water even in winter. 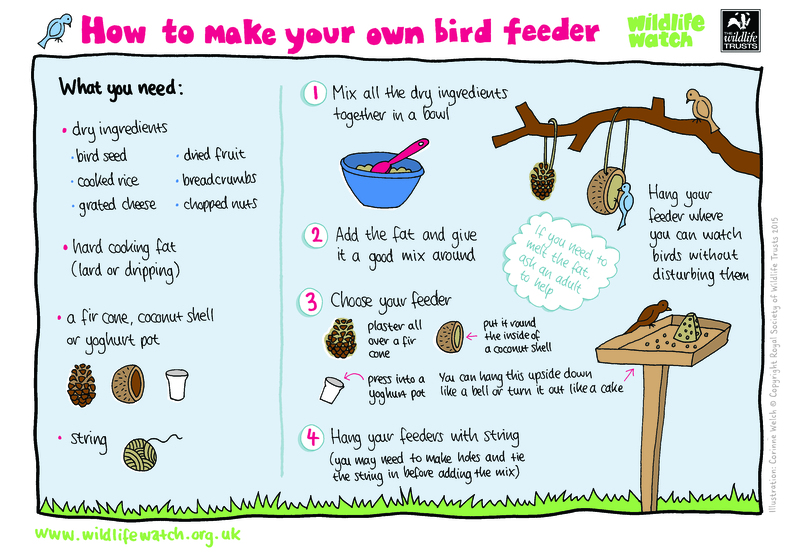 If you’re feeling active, have a go at not only making their food, but also a feeding table! Set them up a bird bath too. Even in winter the birds like to keep clean. 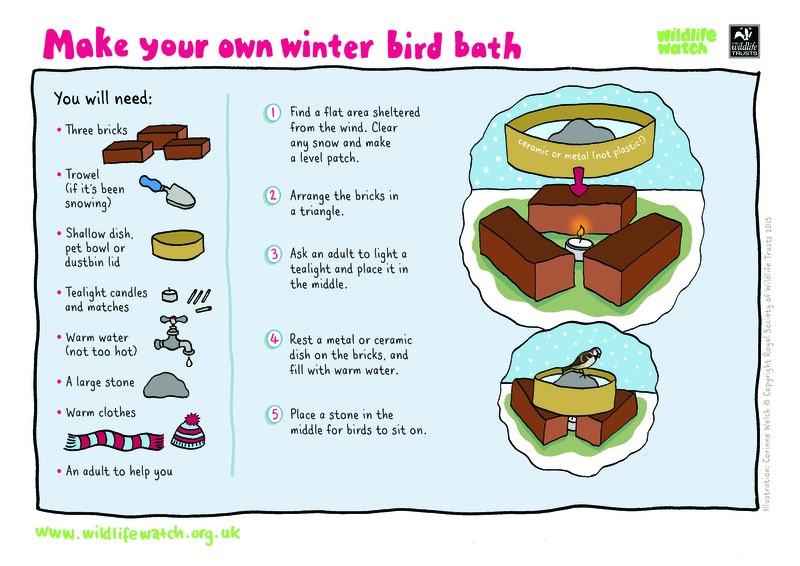 You can help them out and make a heated bird bath, but don’t leave it unattended. Remember to site the picnic well away from where cats can stalk and catch birds. Click here for top tips on feeding your garden’s birds. Make your 30 days really wild and snap a photo everyday for a month. Pick your favourite spot, it might be in your garden or a part of your morning commute. You’ll be amazed at how much changes in one month! Just see how fast things grow after a good downpour, or how plants behave to conserve water when there is a drought. Don’t forget to see what insects are around. The weather can change how plants behave, so keep a weather diary with your pics so you can see how the plants react. Wild-up your workplace and bring nature with you to work. If you’ve got open ground near your office, encourage your colleagues to create a wild space. A bland patch of lawn or paving could be transformed into beautiful plot to sit in or become a focus to grow herbs, including hyssop, sage, lavender and rosemary (all of which bees love!). Buy some wild flower plugs to plant in the grass; short growing plants which the bees love include selfheal, cowslips, white clover, birds foot trefoil. If you’re in an office off the ground, bird feeders will do just as nicely! Hang them out your window, or get a small table that will stick to the window and give you a close up look at the birds you attract. We’ve said it before: nature and health go hand in hand. What better excuse to get out in nature and get plenty of exercise! Do you like looking for birds? Love riding your bike? That’s brilliant because these two activities are made for each other. Hop in the saddle and see what you can spot this summer!! Birdwatching by bicycle is a great way to get outside, enjoy nature and get plenty of exercise! If you’re a budding birder, cycling is a fun, easy and environmentally-friendly way to get around and see more species. If you’re really big on biking, spotting birds as you fly along is just a beautiful bonus! You could simply pedal around your local patch or bike it to your nearest nature reserve (some of which you can cycle through too). The UK’s National Cycle Network includes tons of traffic-free – and wildlife-packed – trails to explore. Play Ein Kleine Nachtmusik (a little nightmusic) as the sun sinks behind the horizon. If you have an instrument (preferably portable, unless you fancy dragging an organ outside!) take it out on a warm night and play as the sky turns gorgeous shades of pink and orange. Get creative and write your own piece of music. Unleash your inner Beethoven and compose an ode to the evening; channel Mozart and write a song for the sky; or jam out and play a gig for the grass. Wildlife and wild places are closer than you think. Just take a look out your window. Even in the middle of a big city, you can always see something wild. From your local park to a nature reserve, a garden to a graveyard, why not explore somewhere wild nearby that you’ve never been before. You never know what new species you’ll discover, or the wildlife you’ll encounter. If you can’t access a wild place near, bring the wildlife to you and make your desk or your windowsill a little more wild! Rock balancing is taking the art world by storm. Amazing artists such as Andy Goldsworthy, Bill Dan and Dave Gorman have taken nature art to the next level. You can have a go yourself, but you’ll need patience… A lot of patience! Pure balance – each rock in near-point balance. This is where each rock balances independant of any others. Counterbalance – lower rocks depend on the weight of upper rocks to maintain balance. This leads to a wonky tower that doesn’t look like it should be standing! Balanced stacking – rocks lain flat upon each other to great height. This looks really good, like a big cone, but you have to hunt for flat rocks of different sizes. Free style – mixture of the two above. Go wild and balance what you can. Take a look at rock balancing artist, Adrian Gray’s work and be amazed! On those hot summer days, what’s better than a cool dip? Pack a towel and some lunch and invigorate your morning with a cool swim. Get fit and appreciate nature, and swim somewhere wild – you’ll get closer to wildlife when you swim in ponds and rivers… even kingfishers will tolerate a wild swimmer nearby (just make sure you’re allowed to be there)! If you are not sure where you can do it follow this link. Please note, wild swimming can be dangerous and should only be undertaken by or with the aid of trained professionals. Always make sure you have thoroughly researched your location and are aware of any potential hazards. If you choose to undertake wild swimming, it is at your own risk and it is up to you to make sure you use your own judgement on safety. Hazards come in all shapes and sizes, such as shock from cold water, slippery rocks, sudden deepening of the water, weeds and fast currents. Remember to wait an hour before swimming if you’ve eaten! Check out these safety and legal guidelines if you’re unsure. The Wildlife Trusts does not take responsibility for any of the Random Acts of Wildness on this website being carried out, and urges all members of the public to undertake these activities safely. Don’t waste those summer days inside preparing your food, bring it out into nature! Make your own outdoor kitchen so you can spend more time outdoors in good weather. Chop your veg in the sunshine, cook your burgers on your barbecue and use fresh mint or fennel in your salads. If you’ve got a camping stove, even better! . Edible flowers include blue borage, daylilies and nasturtiums, but if you’re not sure, leave it out. Don’t forget to compost your peelings. Take life out of the fast lane and get up close to a garden snail…watch it move it’s head & tentacles towards you as it senses you in its ‘space’. There are about 90 species of land based snails as well as water snails so if you want to get spotting there are plenty to see. They are fascinating creatures and have a homing instinct so throwing them over the garden wall won’t help you much if you want to keep your garden snail free! The best way to stop them slowly digesting all your plants is to encourage more wildlife into your garden. This may seem like a fallacy, but the more wildlife and bugs that are in your garden, the more of their predators you will get. Hedgehogs love snails and slugs, so inviting them into your garden will help your plants! For a really complete picture of snails visit this site so find out everything you can want to know about them. Snail on handle © Tom Marshall, Children and snails © Emma Bradshaw. Be an entymologist for the day! Get out with a net and magnifier pot and sweep through the long grass and hedgerows. Homemade sweep nets are great for swishing through grass and catching small insects, although not really suitable for butterflies or moths. Insect sweep nets can be bought of course but they can be expensive, so this method is definitely cheaper and great to practice with. To make a sweep net you just need a coat hanger, a bamboo cane (no more than 1m long) and a wide carrier bag or old pillow case – white or pale is best so that you can see what you catch. Pull out the coat hanger to make a circle but don’t untwist or cut it. Straighten out the hook and slot it into the bamboo cane and secure with some tape. Attach the carrier bag or pillow case to the coat hanger using strong tape and there you go. 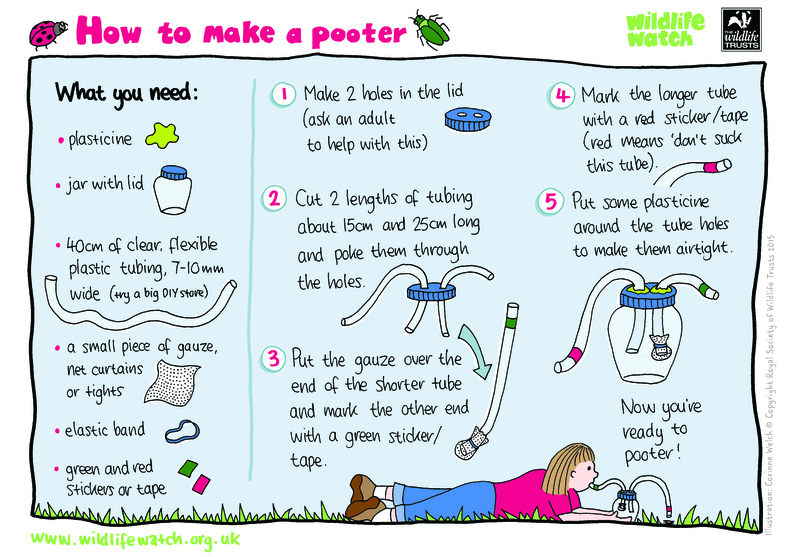 Why not have a go at making a pooter? That way you can really see what you’ve got. A hard days work, or a relaxing day with your feet up, take a break in nature. Stop and look around at nature busying on with its day, the bees buzzing, insects flying, birds singing, flowers following the sun. Brew an iced coffee, iced tea or keep it simple with an ice cold glass of water to cool out off. If you feel like challenging science, even on a hot day, stick the kettle on and brew a cuppa! The theory goes that hot drinks warm the body’s core, meaning the body doesn’t have to work as hard to maintain core temperature, meaning you cool down. So a hot drink does cool you down. Change your usual dog walking route to a wilder walk and get our four-legged friends wild this June too! Going all the way back to their wolf ancestors, dogs LOVE to roam. That’s why they love walkies so much! If you change their route, they will love the new smells and sights that they’ve not experienced before so time outdoors benefits not only you but your dog! You can even go to your local reserve! Many of our reserves welcome dogs, but always check with the local Trust first. Even if dogs are allowed, please remember that these are conservation sites, so always keep your dog on the lead and in control, and always clean up after your dog. Become a spy for the day and track an animal. I can see… a shoe, a cat, and a tortoise. An azure canvas streaked with pure white brush strokes; on long summer days when the sky opens, take 5 minutes out of your day, lie back and gaze at the clouds. Now your imagination is the artist, what will you paint? It’s recommended that for every 20 minutes you spend looking at a computer screen, you should look away for 20 seconds. Take this short break to look out a window, even if you don’t sit by one at work, and look for a different shape each time. Go boho and wear a flower in your hair (don’t pick wildflowers, though!). Show off your wild side by wearing clothes with wildlife on them, too! Have a go at ‘painting’ your clothes – practice on an old t-shirt first! Fabric pen and crayon sets are very reasonably priced and available online so what’s stopping you? You could even make your own cotton reusable shopping bags if you don’t think your artistic skills are good enough for clothes. 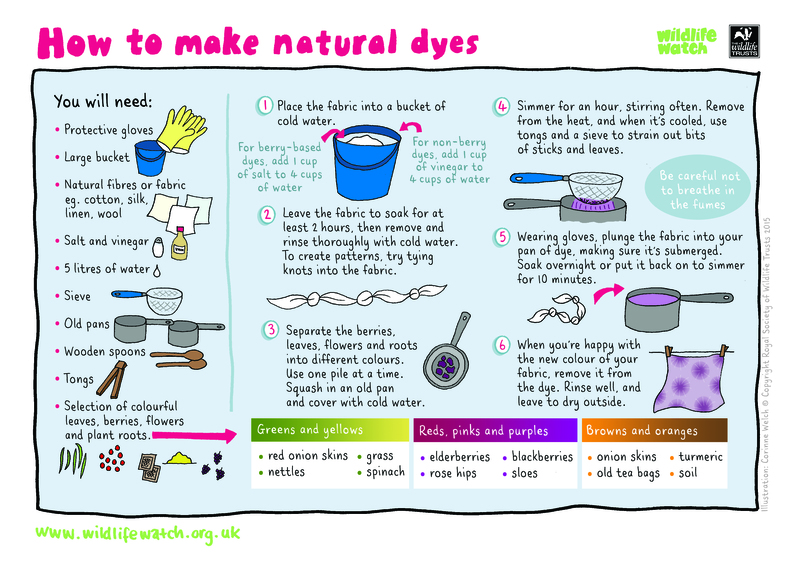 If you’re feeling really wild, have a go at making your own natural dyes and give your old clothes a new lease of life. 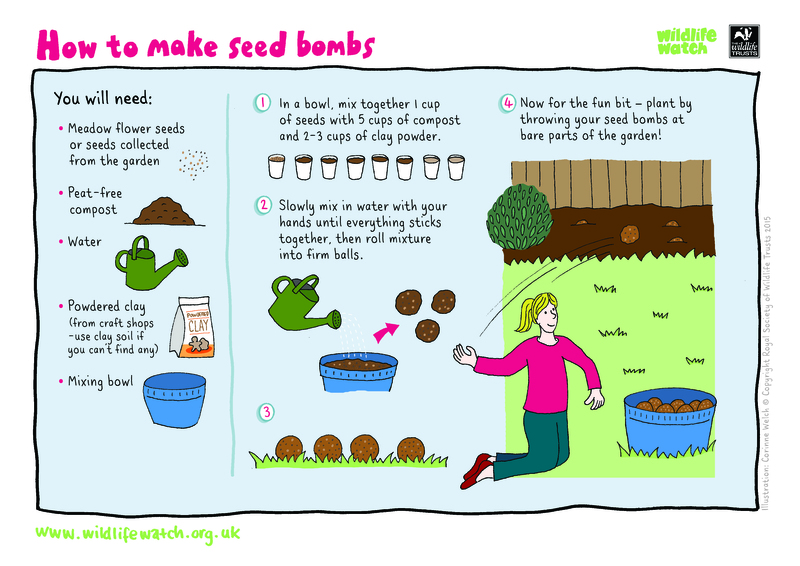 Become a guerilla gardener and throw wildflower seedbombs in hard-to-reach locations. 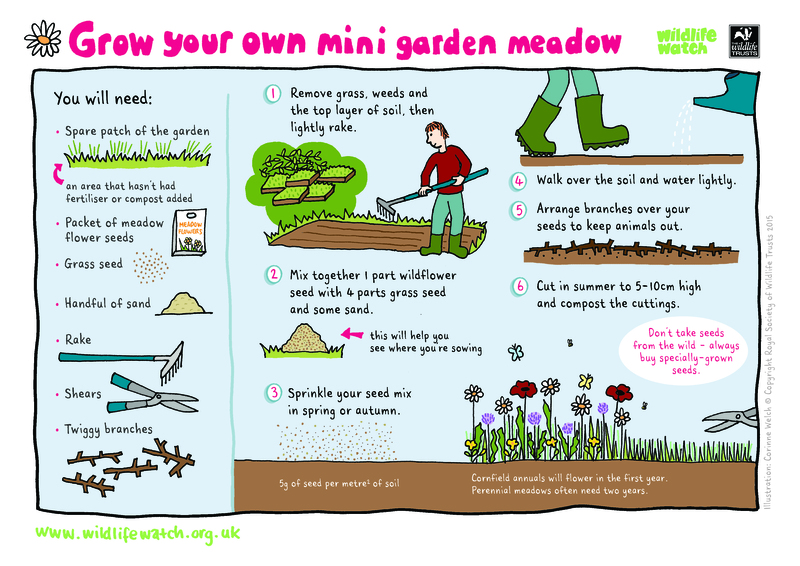 Why not make a mini meadow in your garden? Basic mixes from wild flower specialists include – cornfield annuals (poppies, cornflowers etc), hedgerow or woodland mixes, bee and butterfly mixes, or you could make up your own to suit the growing conditions. 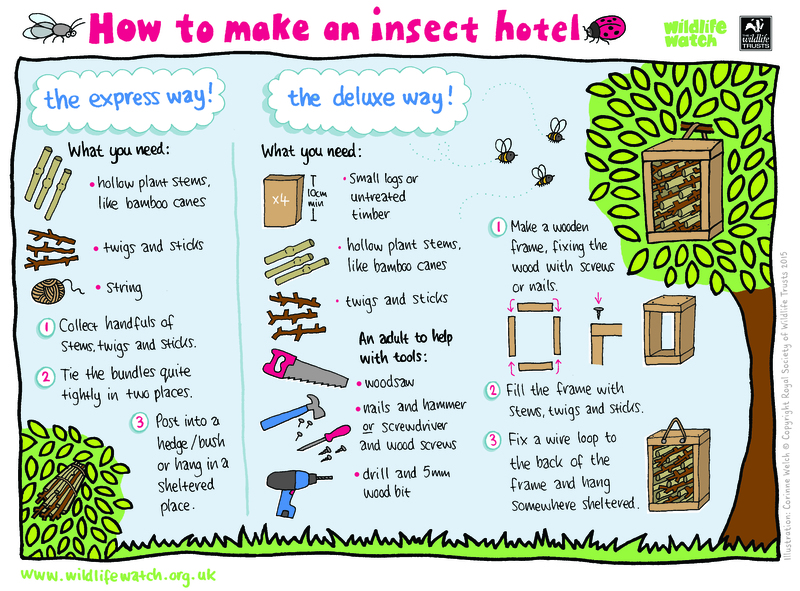 You can download activity sheets and discover loads more on our Wildlife Watch website! Climb a wild tree. Why? Why not!! Take a friend, Dad, Gran… anyone! Dangle from a branch or take a book up high with you and listen to bird song. What better way to get wild? Be careful if you see trees with fungus brackets on them, or bark missing, or branches that don’t have any leaves in summer as they may be rotten and not be able to hold your weight! Check for bees nests or other animals as you wouldn’t want to disturb them either. Just to point out the obvious; only climb onto branches that are wide enough about 30cm and stay close to the trunk (just remember all those childhood cartoon accidents!). Invite a little mess into your garden and welcome wildlife to a wild corner! Leave a pile of leaves (pun intended!) in a corner or pop up a bird feeder. You could even make your own! Tidyness is the enemy of nature so let things be as much as possible; the decaying plant materials, leaf litter and rotting wood, provide food sources and rich habitats for thousands of different kinds of organisms. Only cut down dead trees if they are dangerous. Make your own leafmould to use as your own perfect soil conditioner. It’s one of those rare talents that few have and fewer learn (like rolling your tongue), but we’ve got all the know-how to have you whistling a symphony in no time. Make sure the grass is taut between your thumbs, and if you don’t hear anything, try to make it tighter. You can even make a grass brass band! Gather your friends and give each a different width of grass and toot away to your favourite tunes! Nature tables are a fantastic way of showcasing what you’ve found in the wild. Start a nature table at work, school or home: feathers, mosses, fossils – even bones and skulls – are a great talking point over a morning coffee, and a way to bring nature into your workplace. You never know what you’ll find when you’re out in nature and what better way to engage than to touch, feel and get hands-on. Make your garden brilliantly alive this summer. Bees and butterflies LOVE flowers and plants with loads of sweet nectar and will flock to gardens, rich in plant-life. You’ll also be giving a helping hand to our pollinators! Grow some borage for bees and even keep some of the flowers to freeze in ice cubes for those Pimms or cordial moments. Combine a handful of crushed mint leaves and a tablespoon of honey. This ‘delicious’ beauty treatment will leave your skin feeling cleansed and refreshed. Mash a handful of fresh berries with 2 tablespoons of lemon juice, 1 tablespoon of honey and 1 tablespoon of vinegar. This mask will clear and tighten oily skin. Peel and blend half a cucumber until pulpy. Mix in 1 tablespoon of yoghurt. One for the gents, this mask will soothe razor burns and weathered skin. Compliment with a couple of cucumber slices over your eyes for a relaxing rest. When we picture a meadow, we think off sweeping green grass, but we forget that meadows should be filled with multi-coloured life. After WWII, agricultural intensification really took off to provide enough land to meet the ever increasing food needs, and since then the UK has lost 97% of its wildflower meadows. Take advantage of this amazing habitat and visit a wildflower meadow. Traditional meadows are at their most glorious in June – filled with orchids and other wonderful wildflowers. Ask your local Trust for your nearest one and visit after work one evening. Download our free app to find local reserves near you! This is a great game to pass the time and to engage with nature. Play with your friends and see who can spot colours in the order of a rainbow: red, orange, yellow, green, blue, indigo, violet. You must shout out when you find the colour! If you’re playing with kids, a fun variation is to hide bits of differently coloured wool in a wild area and give the children sticks. they will run around looking for the string, but what you’ll see is that they find all the brightly coloured ones first, then spend longer looking for the more naturally colours. You can even use this as a segway into teaching about camouflage, and why animals are the colours they are! When it comes to garden parties, no one does it quite like the British. Wild-up your nibbles: use fresh flowers to decorate your canapés, make nettle soup, pick wild berries for pudding, or make a wild blackberry crumble, and drop a home-grown strawberries into a glass of bubbly! Instead of English Breakfast, why not brew dandelion tea, or wild elderflower cordial? 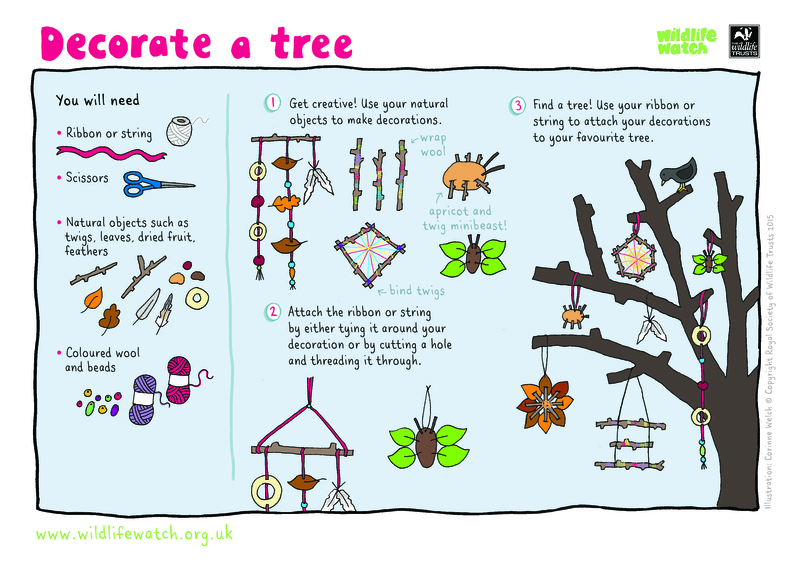 You can even decorate your garden with nature, and make tree decorations. If you use fruit, you can even make a feast for the birds too! Include a wildlife quiz for your guests to take part in. If you are really feeling wild make it a fancy dress party: dress up as plants or animals; the choice is huge. There is a never ending supply of inspiration and resources in nature to make the wildest garden party! When the waves have retreated and the tide is low, rockpools become mini oceans! Shrimp can be found bobbing in the pools and crabs skulk under clumps of seaweed. Starfish cling to the rock face and kelp forests waft in the water, providing cover for snails and small fish. Molluscs, barnacles and anemones sit on the pool floor, and even larger creatures like lobster can be seen if you’re lucky. 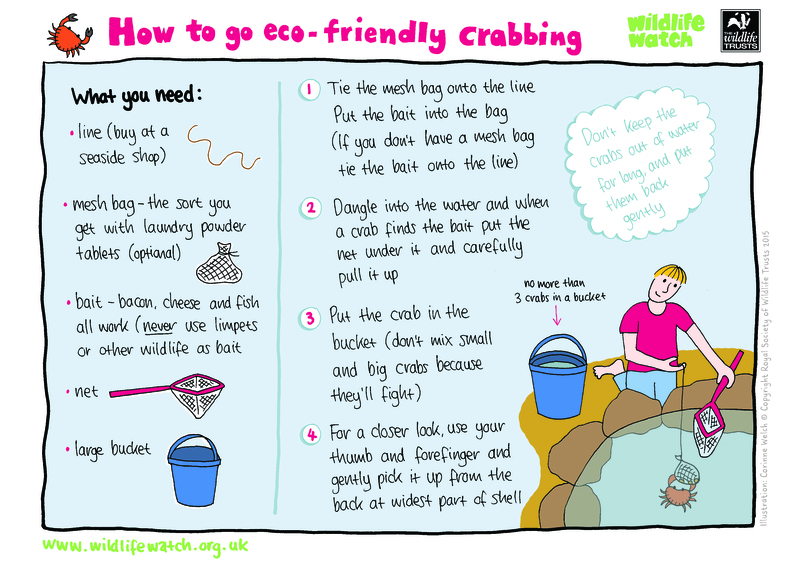 When you’re at the beach, use a bucket and your hands to gently explore beautiful areas of the British coastline: from crabs to fish, starfish to anemones, you never know what you might discover. Always try to look with your eyes and never take things home with you – these little creatures need a specialist habitat to survive in! You’re out walking in the morning and you see a bird of prey, but you don’t know what it is! You’re at work and you see a beautiful flower out of the window. You’re eating dinner outside listening to a songbird, but you’re not sure which one. If only there was a way to keep a note of your descriptions so you can look them up later. But wait! In no time at all you can start compiling your own portable fieldguide that you can take with you. We have some printable spotting sheets that you can access here. They’re great for if you’re out with a family, and you can have a go at wildlife bingo! It’s a sad fact: today’s children are growing evermore distant from nature. We’re on a mission to have Every Child Wild! Make it your mission this June to re-wild a child and allow them to experience nature hands-on. Our Wildlife Watch website, perfect for adventurous explorers, is packed full of information, activities and games to engage children and young people with the amazing natural world around them. But you don’t need the internet or an expert to get you into nature. Just get out there! play hide and seek in a woodland, explore a pond and peer into the depths, investigate a rockpool on holiday. Nature is all around us, and being wild simply means using what nature provides. Climb to lofty heights (and take or tweet a photo from the top too!). Or go to the top of a tall building and get a peregrine’s-eye view of the world. The best views are high, where you can see for miles around with the landscape stretched out below you like a map. If you fancy some serious climbing or are going out in unsettled and cold weather (snow falls on a mountain in June too!) there are some sensible basics to take with you: Waterproof clothing and walking boots, food, drink, head torch and of course a map, compass, GPS so you don’t get lost. Catch up with the environmental news of the day on your lunch or break. Share the stories with your friends and colleagues too! Changing the world starts at home. Your local paper, even national papers, talk of the environmental issues that can inspire change and if enough people take action, then change can start to happen. If you find your local paper never has enough stories on your local environmental issues, write to the paper, or start a nature blog to raise awareness of the things you can do for nature in your local area! Tweet or send a local wildlife issue to a journalist or news reporter – you may get lucky and get them to cover it. Set up a social media campaign and get local or national support for your cause. Ditch your phone for an hour and pick up a nature magazine! Here at The Wildlife Trusts we have some amazing publications, such as our Natural World magazine, or our Wildlife Watch magazine for our junior members. Packed full of information, articles and everyday actions you can do to help nature, magazines are a one-stop-shop for all things wild! It doesn’t have to be one of our magazines though. You can pop to any shop and pick up a wildlife magazine. Go totally wild and read it in nature too. That’s what you call full engagement! What does ‘wild’ mean to you? From a windswept moor to a squirrel in the park, share on social media your idea of wild. Have you got a favourite tree nearby? Maybe it has a ‘face’ in it? Snap a pic and share it, or take a tree rubbing using greaseproof paper and wax crayons. Have you got a duck-friend down at the park? Share it! Do you have a ‘wild-spot’ where you like to relax? Share it! Engagement is the best thing for nature; getting people hands-in and involved in wildlife helps them to appreciate and understand the important part that nature plays in all our lives. Summer is the best time to stay up as late as possible: even all night! Find the darkest wild place possible (or use a blindfold) and let your ears and nose ‘see’ what’s around. If you can head to a wooded area, stay on the down-wind side and listen. You’re more likely to hear activity than see it; our woodland friends have a habit of being unseen! But by far the best thing to do is lie back, look up at a clear night sky and marvel at the awesomeness of space. You’ll never forget that first time you see the milky way, or truly apprehend the vast number of stars. If you fancy giving stargazing a go this map will help you find a really dark place away from urban light pollution. Buy one new eco-friendly cleaning product this week and use less water – your local river will love it and so will you. Make it a bleach free week, and search online for alternative products for bathroom and kitchen. What about yourself too? Look out for soap and shampoos that are better for you and the environment. Microplastics is quite a broad term used to describe any plastic by-product less than 5mm big. This could be through specifically designed materials and products (like face scrubs or whitening toothpast), or through the erosion of larger plastic items (the same way rocks are eroded into sand by the sea). Found in as many as 3 out of 4 cosmetic products, these microplastics are made from Polyethylene (PE), Polypropylene (PP), Polyethylene Terephthalate (PET), Polymethyl methacrylate (PMMA) and Nylon. These plastics are not biodegradable and are now present in our seas and oceans as water treatment facilities cannot filter out the tiny particles washed down our drains. Microplastics have been found in marine species such as fish, shellfish and plankton, and have even entered the food chain, meaning that the food we eat may contain microplasics; ultimately threatening our own health. Face scrubs, body scrubs, tooth paste, shampoo, lipstick, mascara, soap and deodorant among others may all contain these plastic particles. Check any products you have at home for the highlighed chemicals, but don’t flush them down the drain. Instead, switch to products with natural, degradable alternatives. The dawn chorus is one of the marvels of nature. Get up a few hours early and celebrate nature’s symphony. Plus on a clear day, you get to watch the magnificent sun rise. If you can, check the weather forecast and choose a day that has rain forecast later in the day so you can get to see the full ‘red sky in the morning shepherd’s warning’ effect. According to science, the first weekend in May is the best time to hear the chorus. Even though June is a little late, the birds will still be out in full force to serenade your cereal while you munch to the music. Enjoy a cuppa outside and witness the world waking up. Colours are everywhere in nature, not just green! Why not try to get a photograph of every colour of the rainbow and put it in a blog? The challenging ones will be indigo and violet (and you can’t use a violet, no cheating!). What better way to showcase the natural wonder of nature and the fantastic things you can find. Use your smartphone or a camera and snap the pics. Share it on social media with #30DaysWild! This is a brilliant idea for damp areas of the home like the bathroom. And it’s easy too! Using a foam mat and a selection of moss plugs, this living bath mat will absorb moisture and add a little wild to your morning shower. Say goodbye to the soul-chilling cold floor every time you step out and fell like you’re stepping into a magical woodland instead! If you don’t fancy this idea, go outside and have a look at stone walls and tree bark in shady places and be fascinated by the diversity of mosses, liverworts and lichens. What better way to show off your skills than to enter a few photography competitions! The Wildlife Trusts run competitions, check our page to find one near you! Develop your skills as a wildlife photographer to capture magical wild moments. Try starting off by photographing things that won’t run away. Learn about the various buttons and settings on your camera and practice taking shots using the different settings to see how this changes the picture. Notice where the sun is. Light also changes depending on the time of day or the weather conditions, so try taking shots in the early morning or at dusk. Think about the composition of your photo. This means deciding which things to include in your photograph and where they appear. It can be very difficult to get close to wildlife, and hard to get a good shot of a shy creature that runs away. Movement and noise will easily startle wild creatures, so you’ll need to master the art of staying still and keeping quiet! If an animal can’t see you then it is less likely to run away. Using camouflage will help you fade into the background – it’s a bit like wearing an invisibility cloak. Remember that wildlife won’t always do what you want it to do! Escape from the hustle and bustle of everyday life and retreat back into nature. Build a den or teepee in a wood or even in your backyard. On a warm summer’s night, use branches with bracken or just a rope and sheet to make a tent and sleep under the stars. It can be your bird hide and retreat. Wildlife watching opportunities could be fantastic at dusk if you keep still and quiet. Discover urban wildness and mini habitats. Find the wild in the world around you. Look out for colourful lichens adorning walls, mini-forests of mosses on bricks and wildflowers growing in pavement cracks! Look up and there are often tree seedlings growing in chimney stacks and guttering. Buddleia (the butterfly bush) can adapt itself to growing almost anywhere and is a great nectar plant for late summer and autumn. Green your walls with some vertical wildlife gardening! Plant climbers and create nesting space, nectar for insects, berries for birds. There’s an added benefit: you’ll insulate your house and help cool urban streets. Ivy is a fantastic plant as it provides evergreen cover for all sorts of wildlife. The flowers feed the insects in late summer and autumn, and the berries feed the birds in the dark of winter. New research suggests that it doesn’t damage your brickwork either. Let mindfulness become wildfulness and strike some yoga poses in nature! If you’re not feeling up to yoga, try tai chi against the sunset in the park. Start a nature trail for friends or family – use twigs, pine cones and so on to direct them on their own journeys of discovery, and you could even hide a secret treat at the end. You can make it as hard or easy as you fancy, and as arty or plain as suits your style. Just get outside and enjoy! We’ve got a great key on how to mark a nature trail! The worst thing in the world is seeing a piece of litter on the floor of a park when there is a bin 20 yards away. Be a champion for nature and pick it up! Improve your neighbourhood and organise a mini litter-pick with friends, neighbours or colleagues near your office: it’ll get you outside, active for a few mins and it’s a great team building exercise. Not to mention the benefits to nature and the natural area! It’ll clear up those dirty roadside verges and allow nature to flourish. Save the world one coffee at a time and buy a reusable coffee cup, or a reusable water bottle and cut down on your waste. Some major coffee chains even offer a discount off your drink if you use a reusable cup. Wondering how to spread the word about your 30 Days Wild? Start a nature blog of your own and share it across social media using #30DaysWild for all to see! (If you let us know we can add you to our 30 Days Wild webpage dedicated to our bloggers!) Just take your camera outside and think what you can write about. If you don’t want to write your own, spend a few minutes reading a nature blog on the internet: there are a huge number out there. Have a glass of wine or cup of tea in the garden and toast the sunset. Be still and wait for nature to arrive. Bats will soon be fluttering over your head, and rustles in the underbrush of your garden herald night-time visitors. Shut your eyes to enhance your listening skills if there is birdsong; what can you identify? Alternatively keep them wide open to make the most of every minute of a summers evening, especially the sunset. Volunteering is not only rewarding, but even just doing a little bit can have massive impact on local wildlife. This June do something great and volunteer with your local Wildlife Trust! We are very proud of our army of volunteers – more than 43,000 people of all ages and backgrounds – who care for and improve local wild places. Their positive action benefits us all. There’s so much you can do close to home which will benefit nature and wild places in your area. You’ll make loads of friends, you’ll get fit and you’ll have a warm sense of achievement at the end of the day that comes from physical exercise and seeing a good job done! Scrub clearing © Barrie Billing, Volunteers © The Wildlife Trust. Let your imagination go crazy and start your own wild adventure. A quest to save a damsel from a dragon; an adventure to find buried treasure; a journey to a distant land! Or you can stay local and see what you always wanted to see in the wild in the UK? Investigate where, when and how – make it happen this June! Record birdsong and set it as your ring tone: next time your phone goes off, it’ll take you back to the wild in an instant! Other wild sounds will do just as well – crickets, bumblebees or the waves on a beach. If you can’t get out to record, you can use one of ours! if you download them all, you can quiz your friends with the sounds of birdsong. How many can they name? Give your neck a rest from staring down at a phone or computer, and look up to the sky: search for shapes in the clouds or spot birds circling above towns and cities, or perching and nesting on buildings. If you live in a major city in the UK, it’s guaranteed that there will be nesting birds on the buildings and, if you’re lucky, you might spot a peregrine pair! So much of our lives are spent looking down, so look up. What can you see? Collect a handful of your favourite leaves or feathers, or pinecones. The thrill of submerging yourself in wild places will take you back to being a child. Climb a tree or hide in a bush. Collect decorations or just relax. Nature can provide anything you need to fully immerse yourself! Share a close encounter with a favourite species. The Wildlife Trusts have launched their Top UK Wildlife Experiences; our top 60 ways to experience the best and brightest of nature! Our new seasonal online guide homes in on the charismatic, the mysterious and the shimmering gorgeous – from gannets to glow worms, newts to nightingales, and bluebells to butterflies – and shows you how and where to get closer to the wild. Take a look at our webpage and vote for your favourite! Sit still, close your eyes and find your inner wildness. It can be hard to find your inner wild in the middle of the working day, so make lunch-hour your time with nature. Escape to your nearest green spot (but make sure to get back to your desk ready for the afternoon ahead!). Listen to the wind, the birds, the rustling leaves. Get in the flow of nature and become one with the world as you take a break from the working day. It might be a good idea to set an alarm to remind yourself to go back to work though! It’s easy to get lost in nature! “In painting, you have unlimited power. You have the ability to move mountains. Take a break from your day and practice your artistry. Follow in the footsteps of some of the greats, and use a natural landscape to inspire your drawing. A beautiful lake framed by happy little trees. A soaring mountain (if you’re near one) topped with fluffy clouds. Remember, in the immortal words of Bob Ross: there are no mistakes, only happy accidents. Design a home for wildlife by recycling bits and bobs from your garden – nature needs lots of textures and hidey holes, so get your creative hat on. Insects love small spaces to live, hedgehogs love insects, and badgers love hedgehogs. Inviting one species into your garden can spark a chain reaction leading to a wildlife rich haven in your backyard! From bug hotels to hedgehog hideouts, consider different homes for a range of creatures and invite all manner of wildlife into your garden. Follow a bumblebee on its bustling, bumbling journey. Stay sharp -you’ll need your eyes and ears to keep up! It’s a sad fact that our native bees are in decline. In fact, over the last 50 years the population has declined by 50%. We need bees and other pollinators! Imagine a world with no flowers, fruit, no chocolate, or coffee even! All of these things are here thanks to the hard work of our bees and other pollinators, spreading pollen from flower to flower. But our native pollinators are in decline and a loss of pollination will have a detrimental affect on everyone. They are valued by you, the public and play a vital role in the production of the food and drinks that we consume. Insect pollinators matter. If you find a bee on the ground, it might be that it’s blood sugar is too low. Mix up some sugar water and put it in a bottle cap next to the bee for a boost. It’s raining, it’s pouring! So what? Go singing in the rain. Just singing in the rain. What a glorious feelin’, you’ll be happy again! Splashing in puddles isn’t just for little ones – so get outside and rock some moves and bust a groove in the rainstorm. Put on your wellies, pull up your hood and get out there. Dance in a downpour and let your troubles wash away with the rain! Make the most of long, sunny evenings and read your favourite book somewhere wild. Up a tree or in a meadow, perhaps! lay back and lose yourself in nature and in your book! Why not pack a glass of wine or a flask of something to keep you warm when evening comes, too? No one knows everything about nature, but there is so much to discover. Challenge yourself to learn a new birdsong, or to identify different trees, butterflies or flowers: it’ll make a great break from work (and you’ll be a whizz at pub quizzes). Give nature a Google and see what you can discover that you never knew. The best thing for nature is an appreciation of it. the more people know about, understand and appreciate nature, the more change we will see. Share your best experiences of nature on Twitter, or start a blog to write about your favourite wildlife. Not sure where to start? The Wildlife Trusts have a fantastic online guide that homes in on the charismatic, the mysterious and the shimmering gorgeous – from gannets to glow worms, newts to nightingales, and bluebells to butterflies – and shows you how and where to get closer to the wild. You can tweet your local tourist board with a picture of your favourite wild place nearby. You could even ask them to include natural areas in their publications. Invite a friend into nature next time you go to a wild place: a wild wander makes a lovely (and cheap!) alternative to a cafe or shopping centre. What better way to share your favourite wildlife than to talk face-to-face with your friends or colleagues. A refreshing walk around your local park, lake or reserve can build on more than your friendship as you both gain an appreciation for nature. Step back and look at your surroundings. It’s easy to forget the natural world around you, so take a little time out of your day to stop and really look at the wonder of the wild. How far can you see? Have you ever been to where you can see? You’d be surprised at the amount of green you can see, even in the middle of a city. Make it your challenge to visit every bit of green you can see from one spot. When you’ve done that, move onto the next spot and go from there! Is there a local nature issue that you care passionately about? Maybe a local wild place or species is under threat, or maybe you have too little wildlife in your area. Write to your MP about wildlife; pen an article for a local parish magazine or send a letter to your local newspaper: tell them why nature matters! Lead change from the front! People love being close to water: crashing waves, a babbling brook, gentle canals or peaceful ponds. So does wildlife. Dangle your feet in water nearby! The best way to cool down is to cool your wrists, ankles or forehead, so on those hot summer days, take a dip and paddle in the shallows. Pack a picnic and enjoy the cool, calming rush of water while you munch your lunch by the riverside. Save a wild life if you find a house guest or pest inside, catch it and release it outside. Don’t kill it! Just make sure that your glass is big enough – we don’t want any trapped legs! Let mindfulness become wildfulness as you take a break and search for inner peace in nature! Close your eyes and feel for the world around you. Synchronise your breathing with the leaves rustling in the breeze; let the birdsong envelop you; feel the solid and sturdy earth below you. Take some ‘me’ time and meditate somewhere wild. Feel your stresses melt away as you lie down outdoors and take a different view of the wild! Its beautiful scents aren’t just for the bees: take a few seconds on the way to work or school to inhale the perfume of a wildflower, a plant or the leaves of a tree. The psychology of smells is so interesting! The scent centre of the brain (the olfactory bulb) is intertwined and really close to so many important parts in our head. The emotional centre (amygdala) and the learning centre (hippocampus) trigger a ‘conditional response’ when we inhale a new scent for the first time. This means that from then on, the scent is associated with what we were doing and how we felt at the time. Amazing! Take a deep breath. What can you smell? And where does it take you? Give your favourite tree a cuddle and work out if it’s ancient. If you’ve got an oak that is three adult hugs (or more), a beech measuring two or a skinny rowan tree that’s one hug round, then you’ve got yourself an ancient tree that could have been alive for 100s of years! In the open, most trees grow an average of 2.5cm of girth (length around) for each year of their lives. So a tree with a girth of 250cm would be about 100 years old! In a woodland, they grow about 1.25cm a year so a tree of the same size would be 200! Your details will not be passed onto third parties outside The Wildlife Trusts.